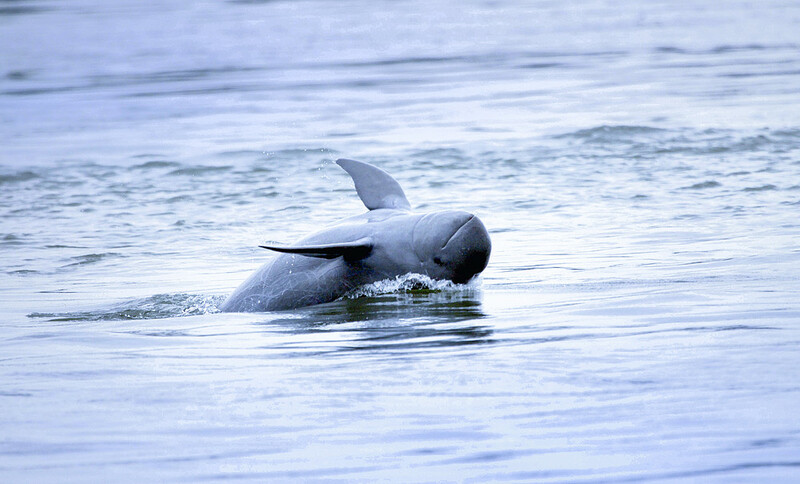 The Irrawaddy dolphin symbolizes the magnificence of the Mekong River and its continued high biodiversity. The latest population survey showed that only 92 Irrawaddy Dolphins inhabit the Mekong River. Even this low number would make the Mekong subpopulation the largest of only five remaining critically endangered freshwater populations of this species in the world. The Irrawaddy dolphin (Orcaella brevirostris) inhabits a 190km stretch of the mainstream Mekong River between Kratie, Cambodia and Khone Falls on the border with Lao PDR. The Irrawaddy is a shy, small dolphin that is dark grey in colour with a paler underside, a small rounded dorsal fin and a bluntly rounded head. It can reach lengths of 2.75m, weighs up to 150kg, and normally lives in groups of up to 6. The Irrawaddy dolphin is one of only 3 whale and dolphin species that occupy both fresh and marine waters. Marine Dolphin populations inhabit coastal areas, particularly muddy and brackish waters, while freshwater populations prefer deeper areas of lakes and large rivers. The largest known marine numbers about 6000 animals and is found off the coast of Bangladesh. All five remaining freshwater populations number less than 100 individuals and are listed as critically endangered by the IUCN Red List. Irrawaddy dolphins were once found throughout the Mekong from the Lao-Cambodia border down the Mekong to the delta in Vietnam and in Tonle Sap. The population and range of the dolphins has declined greatly in the last 39 years. During the dry season from January to May when water levels fall, the population is concentrated in nine deep water pools in a 190km stretch of the Mekong north of Kratie to the Lao border. While these pools provide safe habitat for dolphins to rest and forage, such congregations also make dolphins vulnerable to fishing activities. In the wet season dolphins are occasionally seen south of Kratie. Irrawaddy dolphins spend most of their time foraging. They are neither particularly active nor acrobatic dolphins, but they do make low leaps on occasion. Irrawaddy dolphins typically dive for less than 2 minutes, but dive times are longer when animals are frightened. Life expectancy of Irrawaddy Dolphins is around 30 years, and while some individuals reach adult size at the age of four to six, the specific age of sexual maturity is unknown. Young Dolphins show impressive growth rates – born at around 1m and 12kg, calves increase by over 50cm and 33 kg in their first 7 months! Females give birth every 2-3 years; but in stressed populations mating may take place at an earlier age and calving at shorter intervals. 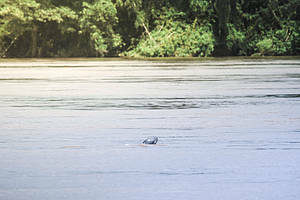 WWF has identified the Irrawaddy dolphin as a flagship species for the conservation of the Mekong River because these dolphins have certain minimum habitat requirements that reflect the health of the river ecosystem for other species, including humans: they require sufficient, undisrupted water, abundant prey, waters unobstructed by human activity and construction, and a clean river system. As a result, population decline in dolphins should ring alarm bells that all is not well in the river. Millions of Cambodians depend on the Mekong’s water for daily use and irrigation and use its fish as a key source of protein and income. To maintain these important resources for an expanding human population, the Mekong must function as a healthy ecosystem with high biodiversity. As the dolphin is generally revered by local people, the species makes a good flagship to mobilize support for broader river environment conservation issues. The Irrawaddy Dolphin’s habitat preferences for freshwater and near shore marine environments make the species especially vulnerable to intensive human use and abuse. Living in very confined areas, freshwater populations are in particularly serious decline in terms of range and size. Overfishing with small-meshed nylon nets that depletes fish stocks and threatens future livelihoods of humans and dolphins. Illegal fishing methods using electricity or explosives can even kill dolphins directly. Dams and irrigation systems reduce habitat availability for fish and dolphins, particularly in the crucial dry season, change the water flow and block fish and dolphin migration. The hydropower-dams that are planned along the Mekong-mainstream could have disastrous consequences for dolphins, many other species, and the people that depend on it, as they cause large-scale shifts in habitat size, water flow, sedimentation, and animal mobility. 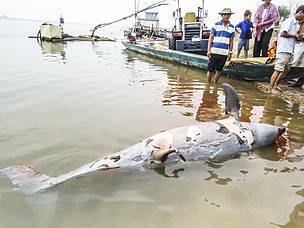 Pesticides, heavy metals, plastic particles and other contaminants from industry, agriculture, and towns have been implicated in dolphin mortality and, since many of these pollutants are persistent, will affect local biodiversity for many years to come. Boat traffic on the Mekong is increasing with rising human populations, development and tourism. This can disturb dolphins, lead to stress and illness, and even result in collision-associated deaths of dolphins through contact with the propeller. The institutional mechanisms put in place have been fundamental in being able to achieve measured success. WWF-Cambodia in collaboration with FiA, provincial authorities, and local communities have been implementing series of the recommendations in the Kratie declaration above and achieved several significantly positive results. Starting with the stabilization of the dolphin population since 2010, numbers of new born calves have been significantly rising, with an annual average number from five to twelve calves since 2007. 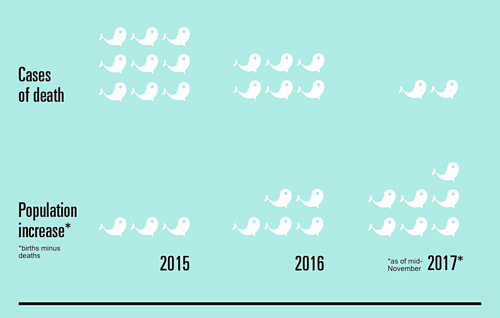 At the same time, the mortality rate constantly declined: from nine deaths in 2015 to six in 2016, and only two in 2017 (as of mid-November), with nine calves born in the same year. Contributing to these results is the attainment of a highly skilled staff base. Their training, knowledge, and capabilities enable them to carry out effective conservation work. Over the years, community members have become familiar with the conservation project and WWF has become a respected and well-known organisation in the region. This, together with having close ties to local media, government officials, and villagers, has contributed to the overall success. Positive results are usually shared with all stakeholders and interested parties.